Model M-32 accessible campfire ring features a flat rear panel so wheelchairs can have closer access to the cooking grate and adjustment handles. The 300 sq. inch cooking grate adjusts to 4 levels between 19" and 24" above the ground. 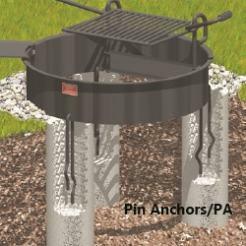 This fire ring design allows the grate to be adjusted one side at a time, using only one hand; without tight grasping, pinching or twisting of the wrist; and does not exceed 10 lbs. to lift. 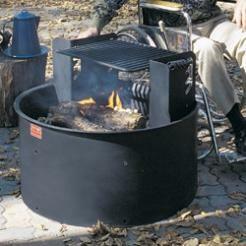 The fire ring is rolled using 3/16" thick steel, with 1" formed flange for strength and safety. The adjustment panels are cut from 3/16" steel, and also serve as heat shields for the grate handles. The 300 sq. inch cooking grate is welded together using 5/8" dia. handle/support bars and 1/2" dia. 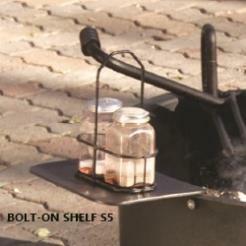 grate bars, and includes handle grips of 1/8" x 1/2" coiled steel. All grate bars are welded on both sides. The finish is high temp non-toxic black enamel paint. Pin anchors provide a fixed location and must be set in concrete. 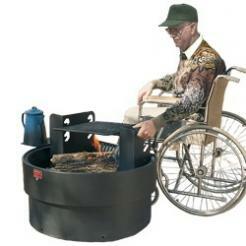 The fire ring is filled with aggregate (not included) to about 10-1/2" deep to provide the elevated fire surface. This fill also insulates the ground to reduce the chance of root fires in heavily wooded areas. Drain/draft holes are provided around the perimeter of the fire ring.